In aqueous solutions at physiological temperature, the mechanism of antioxidative action of natural thiols (glutathione, cysteine, and homocysteine) mainly involves reactions with reactive oxygen species (ROS), peroxyl radicals and hydrogen peroxide. Reduction of hydrogen peroxide by thiols is accompanied by radical generation. The kinetic characteristics of these processes, including those for the reactions of hydrogen peroxide and glutathione immobilized on solid supports such as sodium montmorillonite (clay) and cellulose were determined. Prooxidative effects of thiols are related with the reactions of thiyl radicals formed in the exchange reactions of thiols with other radicals and in the reactions between thiols and hydroperoxides. Thiyl radicals are known to react easily with double bonds. 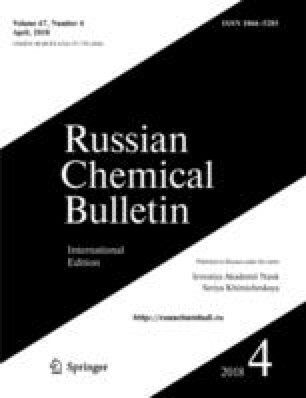 Resveratrol and caffeic acid, phenolic antioxidants containing double bond in their molecules, were shown to be consumed when reacted with glutathione and the process accelerated in the presence of hydrogen peroxide. Published in Russian in Izvestiya Akademii Nauk. Seriya Khimicheskaya, No. 4, pp. 0726–0730, April, 2018. Based on the materials of the III Interdisciplinary Symposium on Medicinal, Organic, and Biological Chemistry and Pharmaceuticals (MOBI-ChemPharma-2017; May 28–31, 2017; Sevastopol, Russia).